Today developer Nightbird has released a PSN Spoofer Tool for CFW 3.55 KMEAW that allows spoof up to 4.31. Check out what he had to say and the release notes listed below. 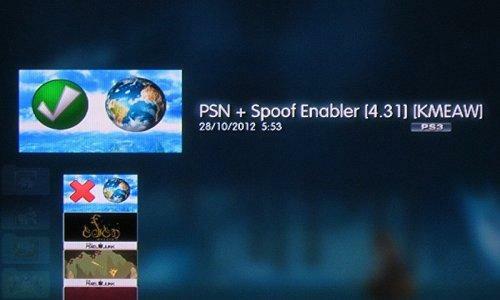 Here is a Kmeaw PSN / Spoofer v4.31 Enabler and Disabler. The Enabler allows you to connect to PSN without any PC based progs, and also spoofs to v4.31. The Disabler restores the original Kmeaw files and returns to v3.55. Both Spoofed and Unspoofed modes are compatible with ReactPSN. I'll do a Rebug update package when I get the chance. If you are using any other spoofers, disable and uninstall them. If you have been using FckPSN, put your original 'CA27.cer' back. Also put your network settings back to normal if you have altered them for connecting via a PC PSN app. This is for Kmeaw users only. Install both the Enabler and Disabler PKG's. To enable PSN and spoof to v4.31, run the Enabler, the screen will go black for about 15 secs, PS3 will then restart, your pad will have disconnected too so press the PS button. You can now check your firmware version in system info, it should say 'version 4.31' and you should now be able to connect to PSN. To disable and return to v3.55, just run the Disabler, screen goes black again and PS3 restarts. Thanks to Evilnat for the eboot. Aldo for his excellent toolset. Itskamel for psn on 3.55. Rebug.